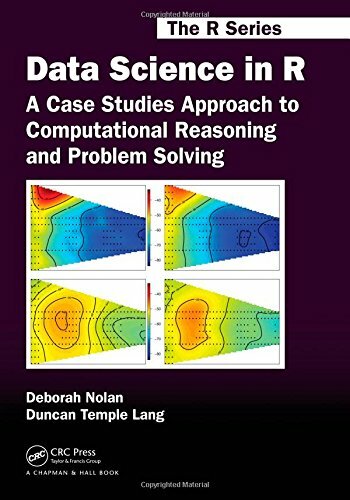 Data Science in R: A Case Studies Approach to Computational Reasoning and Problem Solving illustrates the details involved in solving real computational problems encountered in data analysis. It reveals the dynamic and iterative process by which data analysts approach a problem and reason about different ways of implementing solutions. Suitable for self-study or as supplementary reading in a statistical computing course, the book enables instructors to incorporate interesting problems into their courses so that students gain valuable experience and data science skills. Students learn how to acquire and work with unstructured or semistructured data as well as how to narrow down and carefully frame the questions of interest about the data. Blending computational details with statistical and data analysis concepts, this book provides readers with an understanding of how professional data scientists think about daily computational tasks. It will improve readers’ computational reasoning of real-world data analyses. If you have any questions about this product by CRC Press, contact us by completing and submitting the form below. If you are looking for a specif part number, please include it with your message.